I have a weaving “bucket list.” Making a handwoven jacket is on that list. I took a step toward that dream with Michele Belson’s (of Lunatic Fringe Yarns) workshop on pattern drafting last week. 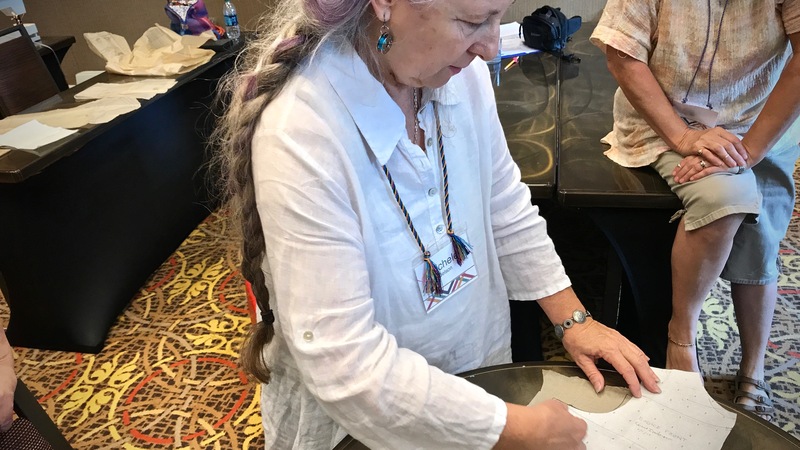 This Contemporary Handweavers of Texas Conference workshop was exactly what I needed. 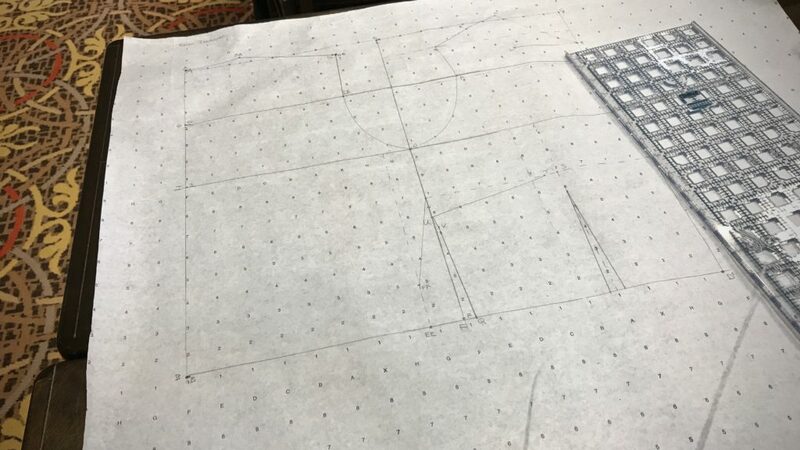 Taking precise body measurements is the first step in making a body block pattern draft. The measurements are then transferred to the pattern paper in a systematic way. My handwoven “Mary Poppins” bag on the floor holds all my supplies for the day. Front and back bodice patterns in progress. Making a muslin by transferring pattern markings and adding seam allowances. I can weave fabric for a jacket. And I have sewing skills to sew a jacket. But the fitting! That’s been the missing link for me. And who wants to cut into handwoven fabric when the fit is not a sure thing? Muslin pieces are sewn together so the bodice can be fitted. Michele Belson checks the fit of the muslin. After some small adjustments, she pronounces it a perfect fit! Ease will be added, suitable to the garment being made, when the time comes to make a garment pattern. 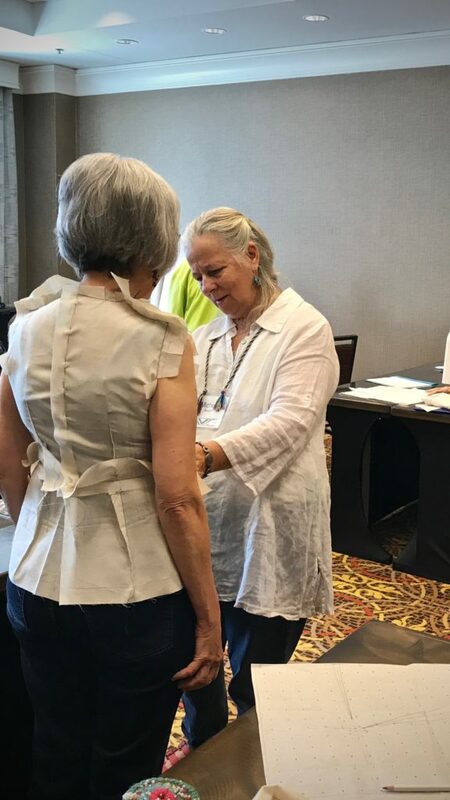 Michele demonstrates how to use the finished body block pattern draft to adjust the fit of a commercial pattern. Mindful attention to details. Processing information to apply it to the work in your hands. Learning a glossary of terms. Combining new skills with old ones. Listening, with an intent to understand. These are elements of wisdom. Think of the created world around us. Look at the detail, complexity, and beauty in it. Is it any surprise that our Creator is the source of wisdom? Wisdom is the key to skillful work. And, as always, it must be applied and practiced. I will certainly practice fitting and sewing. And then, when it’s time, I’ll weave jacket fabric, and let wisdom guide me in cutting it. I’m curious, do you have a weaving bucket list, too? Back in the old days when I was teaching sewing pattern making, we called it a sloper. Did you hear that word being used? After careful fitting, we made the sloper out of cardboard. Then, you could use it to make any type of garment. My usual problem was not adding enough ease. Hi Joanne, I am familiar with the term sloper, but I didn’t hear Michele mention that. 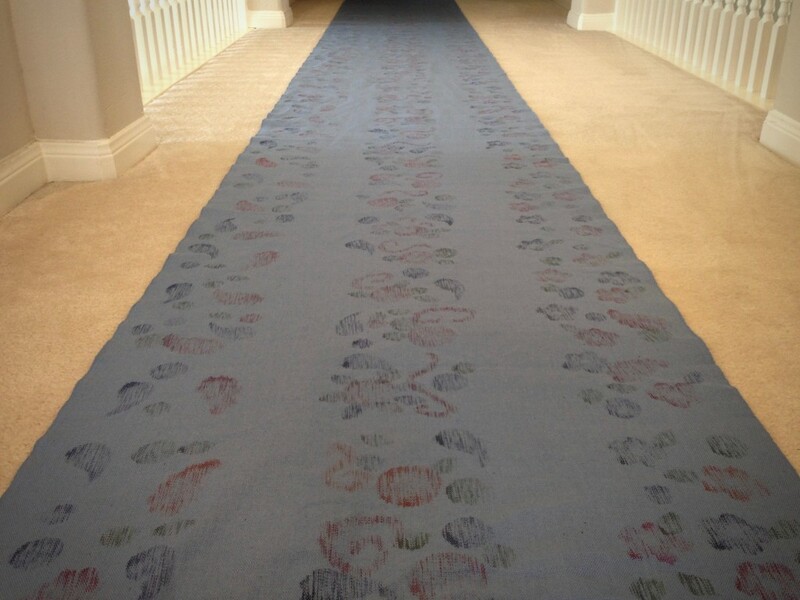 She did say to make the pattern on poster board, so that’s exactly what I did when I came home. I’m not ready to draw my own jacket pattern, but I’ve started an attempt to adjust a commercial pattern. We’ll see how it goes. What a great class! I am looking forward to seeing your creations, Karen. So glad you took Michele’s class. Hi D’Anne, I know you would have loved it! I’m looking forward to getting together with you to show you what I learned. Good for you! So many people are afraid of taking this step. As a former patternmaker in the fashion industry, I can’t wait until my weaving skills are up to the task of making yardage for a garment for myself. I’m sure it will be a rewarding experience, as I’m sure that making your jacket will be. 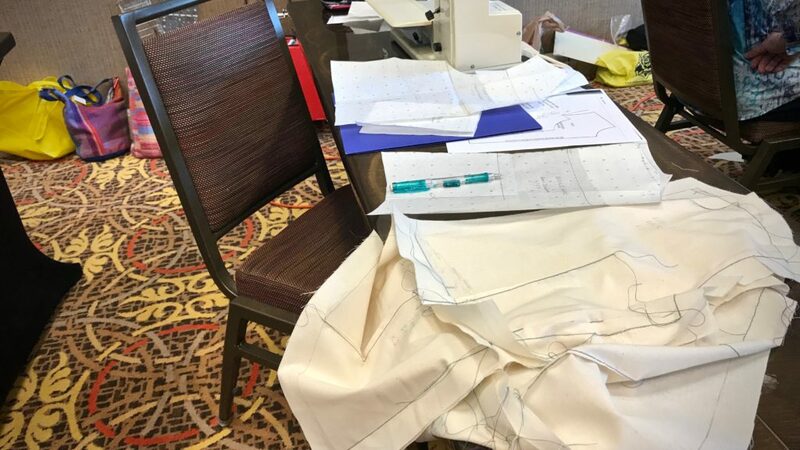 Hi Sandy, I’m impressed that you have experience as a patternmaker! Weaving yardage for a garment will be wonderful accomplishment. I can’t wait to see what you make! Sounds like a great workshop, and one that I need! I’ve got 2 lengths of handwoven fabric now that I’m afraid to cut into. I’m going to suggest this as a local workshop. 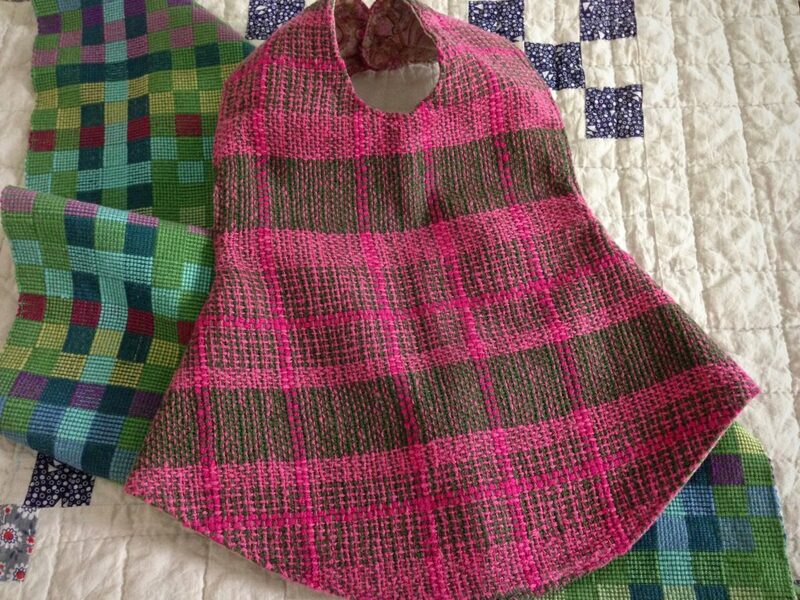 Hi Peg, Maybe you can start with making something small with your handwoven fabric. I’ve had fun making bags and things, and even a hat from smaller pieces, as well as a skirt that didn’t take much fitting. That has helped build my confidence for cutting into the fabric. If you get a chance to take Michele Belson’s workshop, though, I would recommend it! January 1st is more than just another day, isn’t it? It’s a time to review the past year and bring new dreams into the year ahead. This pivot point calls for gratitude. I am especially grateful for friends like you who walk with me on this weaving journey! Thick and thin cottolin towels on this warp. One towel to go! The end is near! The end of the warp, that is. Almost ready for the final border of the halvdräll table square. 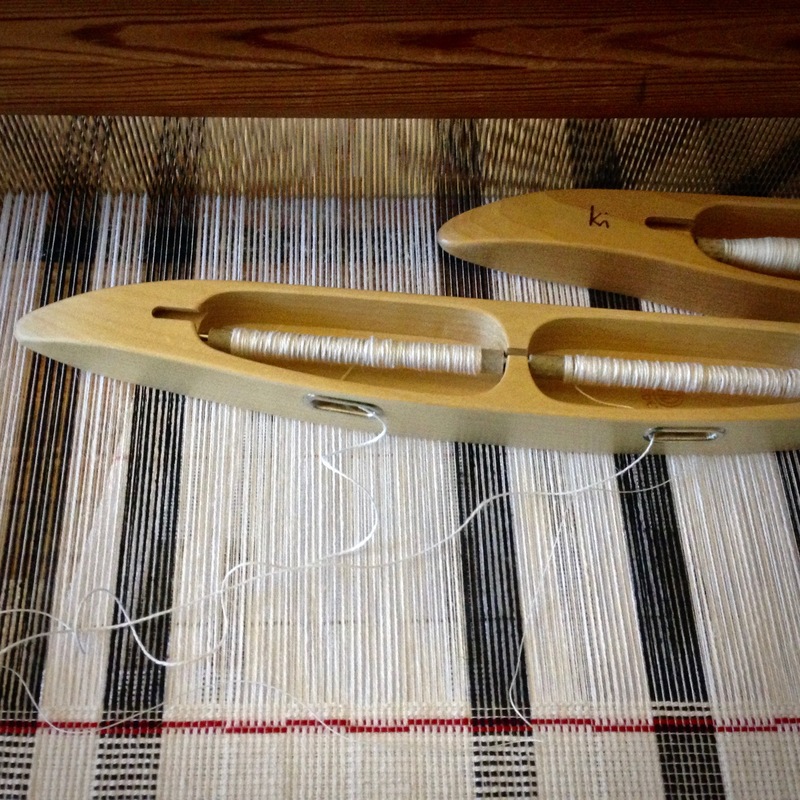 There will be just enough warp left for a short sample piece. First up in the new year I have thick and thin towels to finish, and the halvdräll is oh so close to the end of the warp (didn’t quite make it for Christmas). 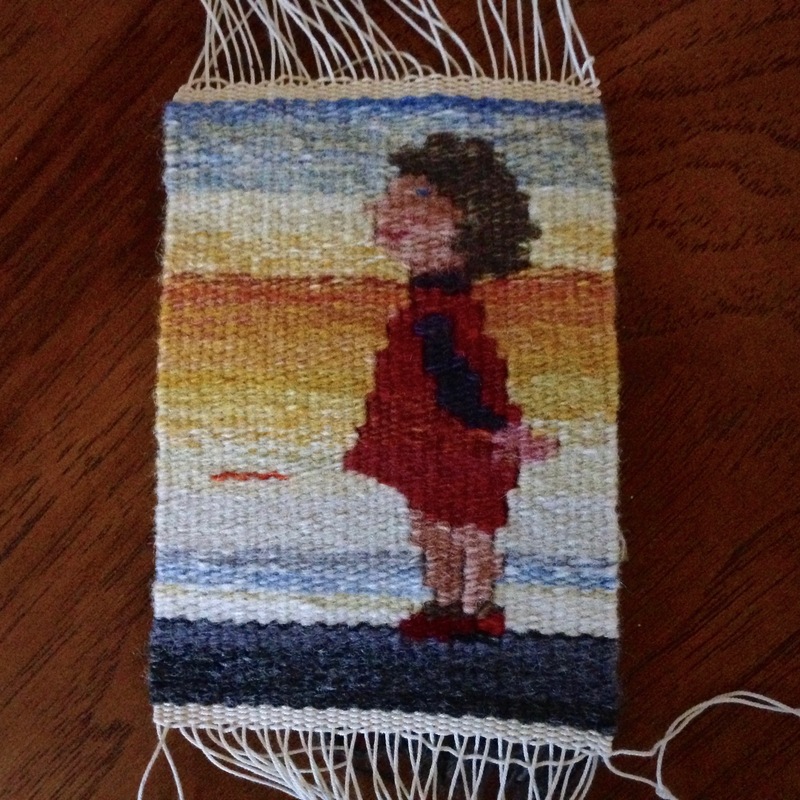 And one little girl is off the small tapestry loom, waiting for final finishing, mounting, and framing. Little girl small tapestry. After finishing the ends, the piece will be mounted on linen-covered foam board and placed in a frame. Thank you for walking with me through 2015! May you bring big dreams into the new year! What a lovely review of your year’s weaving work. A large and beautiful body of work. Charlene, I appreciate your kind comments. Thank you for taking the time to write! Thank you for seeing such beauty in life and sharing it with us! This was a very inspiring way to start a new year! Happy New Year to you and yours, dear Elizabeth! Happy New Year! I really enjoy reading your blog and look forward to new posts. Have a wonderful new year! I look forward to hearing about your time at Vavstuga in coming weeks! Always nice to see what you are up to! Best wishes for 2016. Thank you for the kind wishes, Fran! Best wishes to you, too! I hope it is a wonderful year for you! And a Happy New Year to you, Liberty! I hope it abounds in blessings for you! Your tapestry of the child is wonderful. 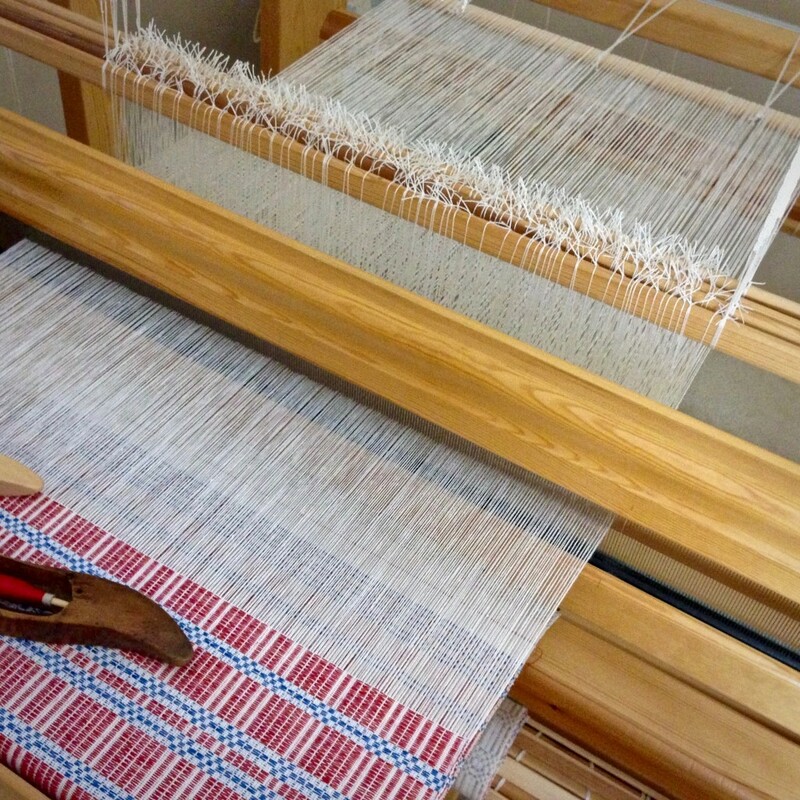 It has given me so much pleasure to see how your weaving has become so absolutely gorgeous. I’ve has so much fun watching all the love you’ve put into your weaving. The article was a cherry on top of the most delicious desert anyone could have dreamed of. Your encouragement means a lot to me! I hope you experience an abundance of love, peace, and joy in 2016, my friend! Printed fabric collects on the cloth beam. One last round of warping slats is seen on the back beam. 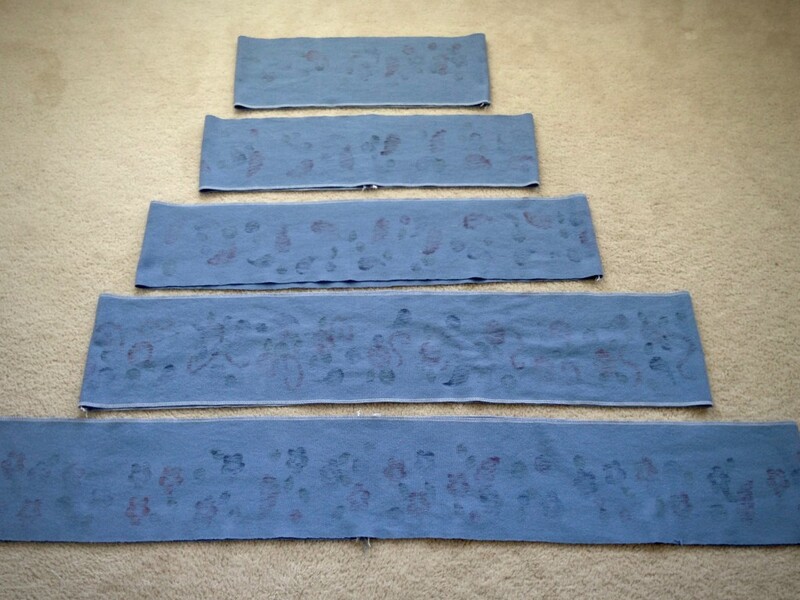 I needed five lengthwise tiers, so I planned it out so that each tier would have a different stamped pattern. This is light blue 8/2 cotton in plain weave, with a dense sett of 30 epi, making a medium-weight fabric. 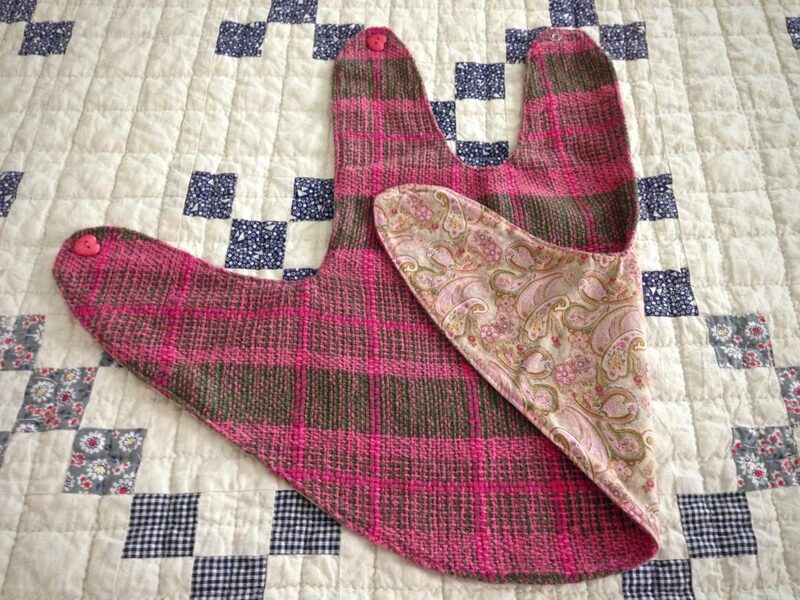 I softened the fabric as much as possible by washing and drying it on hot settings. 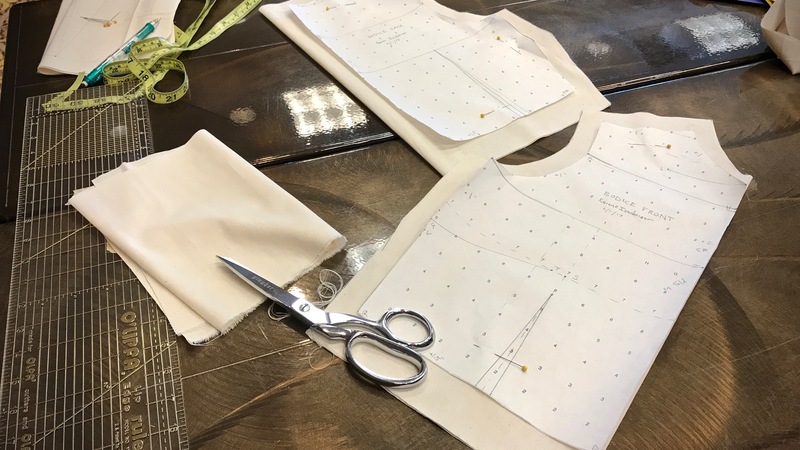 By strategically placing selvedges at the top and at the bottom of the skirt, I was able to minimize thickness at the waist, and eliminate the need for a hem at the bottom. The finished tiered skirt is long, and full, and has a subtle pretty printed pattern that mildly resembles ikat. And this skirt is made for wearing with boots! 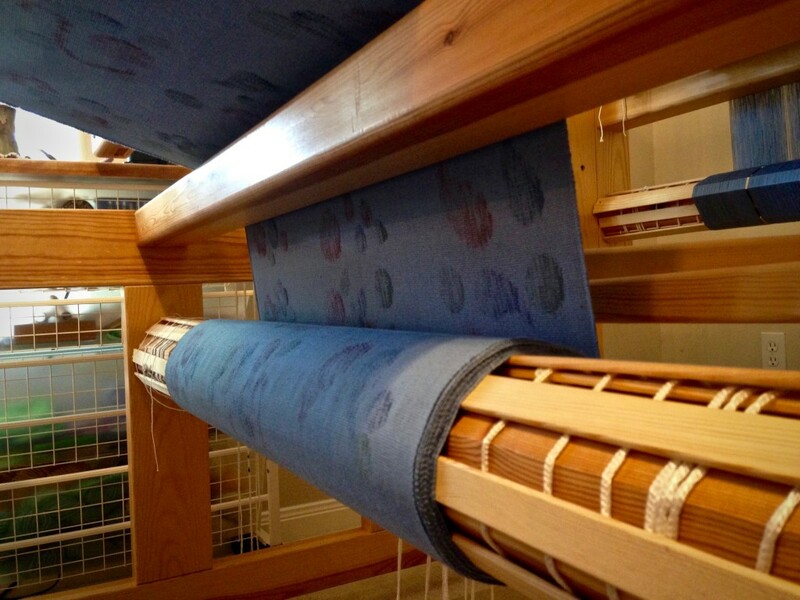 Just off the loom, cloth is rolled out on the floor. Five-tiered skirt was made from lengthwise rows of printed fabric. Tiers are cut and raw edges serged. Each tier seam is sewn. 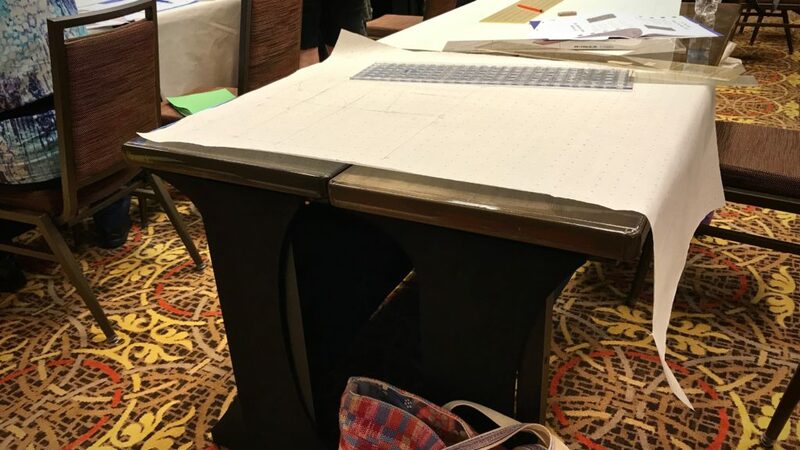 Floor layout helps to plan placement of seams and printed patterns. Bulk is reduced at elastic waistband by adding pretty grosgrain ribbon for the casing, right next to the handwoven fabric’s selvedge. 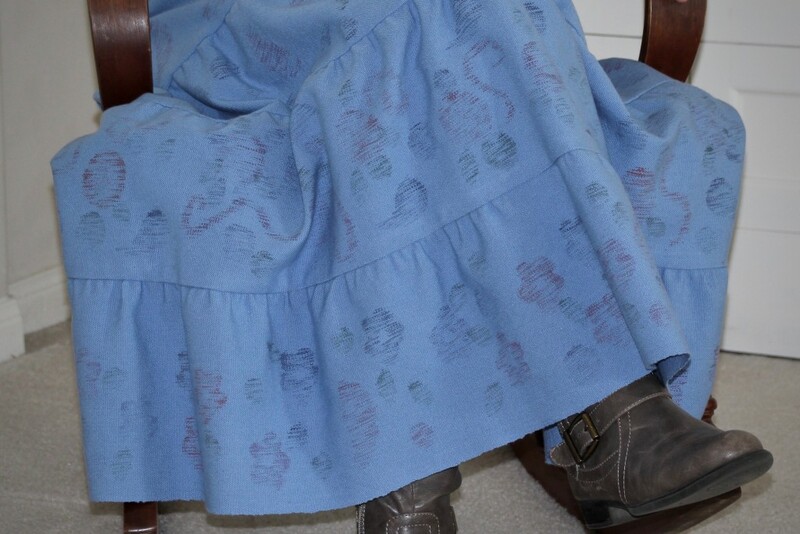 Selvedge forms the bottom edge of skirt, so no hem is needed. Warp-stamped fabric appears as a subtle print. May your heart be enriched with thankfulness. It has been so much fun to follow this from beginning to finish, great job! And I’ll stash the waist band trick for sure…. Thank you, Pia, I appreciate that! It makes me smile to know you had fun with this, too. This is fantastic. I loved seeing the whole process of this skirt. It looks great. This came out beautifully. I loved following along. And it does look great with boots. It turned out incredible! I’m so glad we all got to see the finished skirt after watching you weave the fabric. Ooh, pretty! Nice haircut too. I noticed a very special blanket on the back of your chair, it looks splendid in situ. Thank you for the sweet comments. It is fantastic to have friends along on this fun weaving journey! Thank you so much for sharing. So very pretty and so inspiring. What a kind thing to say, Loyanne. Thank you so much! Your skirt is beautiful and you wear it with pride. It must feel great to put it on knowing that you made it from start to finish. I enjoyed watching every step. Thank you. Carolyn, Thank you! 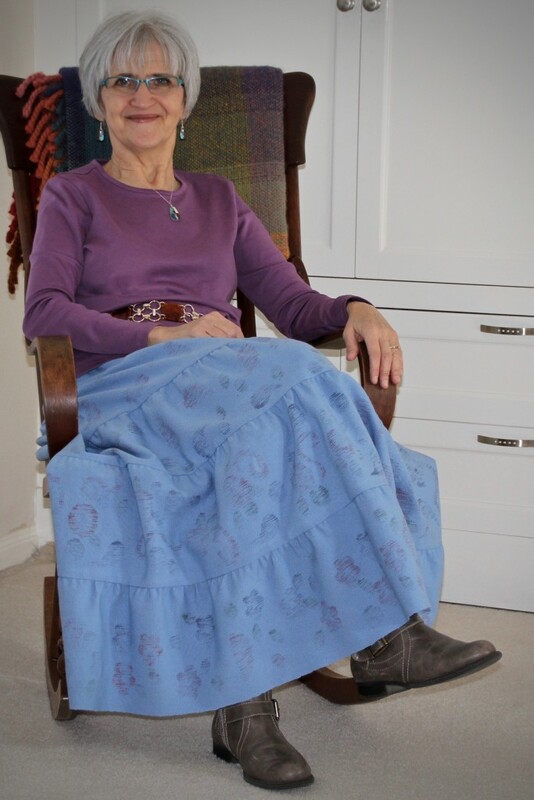 Yes, it’s a great feeling to have a skirt to wear that I made from scratch. I’m so glad you’ve been following along! I’ve been following this project, too, Karen, and have to say I wasn’t sure where you were going with this one. However…..WOW! I love it! Great job! Hi Marcia, I’m so happy to hear you like the results! It is a lot of fun to wear this skirt! Love, Love, Love your blog. Such an inspiration both spiritually and artistically. Thanks for sharing. 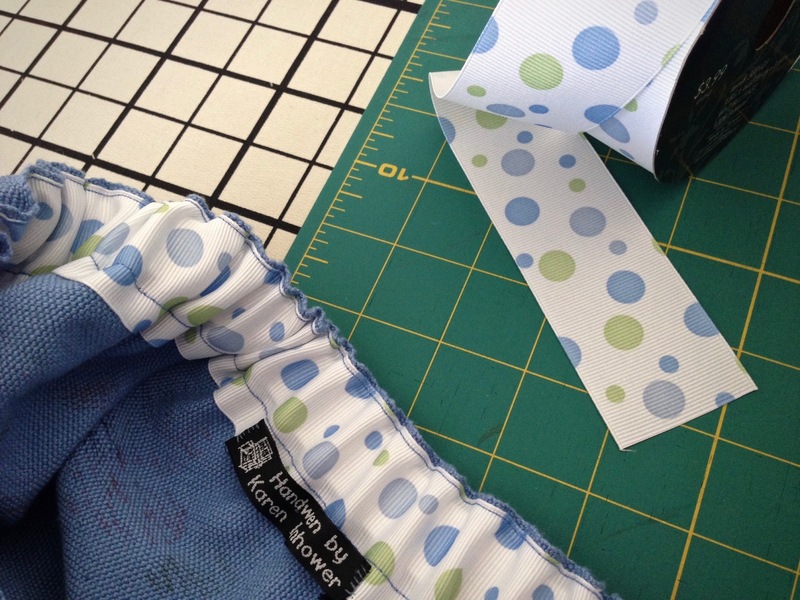 BTW – wasn’t it hard to take the scissors to your finished fabric? Rebecca, you have really touched me with your sweet comment. It didn’t seem hard to cut the fabric this time, since I knew exactly what I wanted to do with it from the very start. 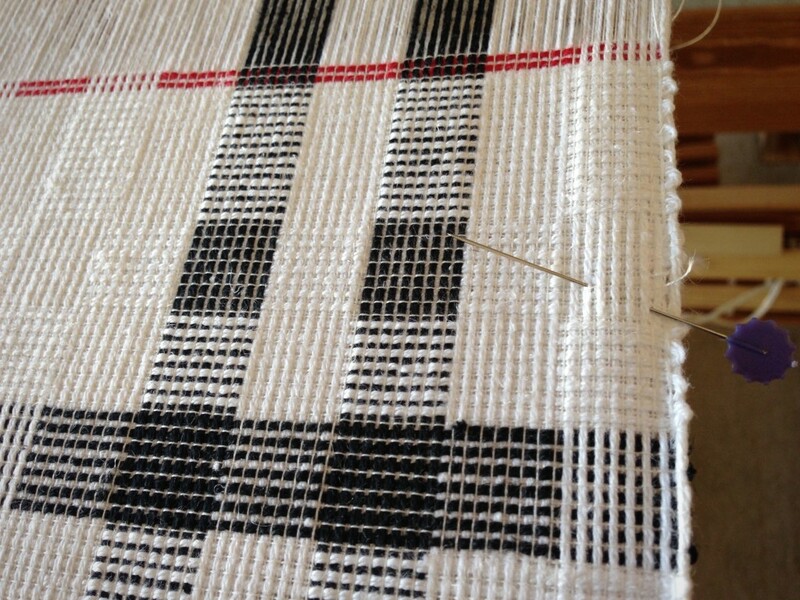 All the while I was weaving the fabric I was anticipating the sewing to come. I must say, though, that I did measure at least three times, and carefully chalked the lines, before making the first cut. I love your skirt, you did a great job! Hope you had a great Thanksgiving. Hi Liberty, Thank you so much! We had an absolutely wonderful Thanksgiving. I hope you did, too. I love your skirt. Sooooo beautiful! Helga, That’s wonderful for you to say so! Thanks! Tools Day: Let There Be Light! Sunshine coming through the windows is marvelous for weaving. But my eyes need extra light to see small details. This is noticeably true with errors that I mend on the loom and off the loom. 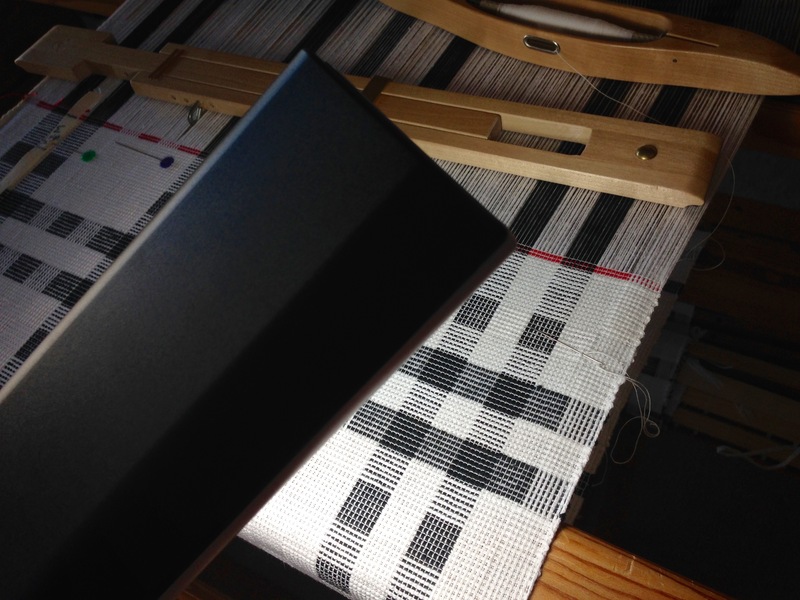 I turn on extra lighting at other times, too–when threading fine threads, sleying the reed with fine or dark threads, counting picks per inch on woven cloth, and checking the treadling pattern in a fine weave, for example. And sometimes I turn on extra lighting for no other reason than it’s a cloudy day. 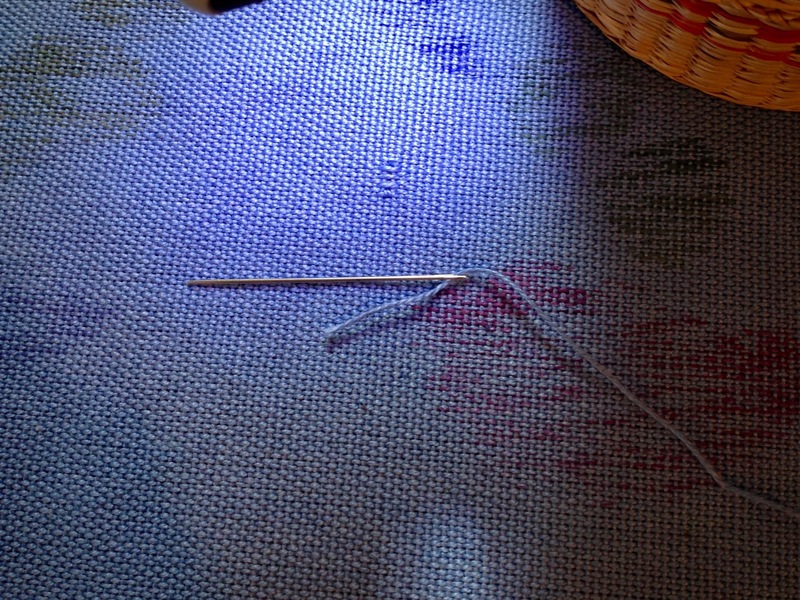 Pin marks the spot where I broke a thin weft thread, 30/2 cotton, with the temple. Repair area is flooded with light from my portable OttLite. Illuminated stitches are easily seen. 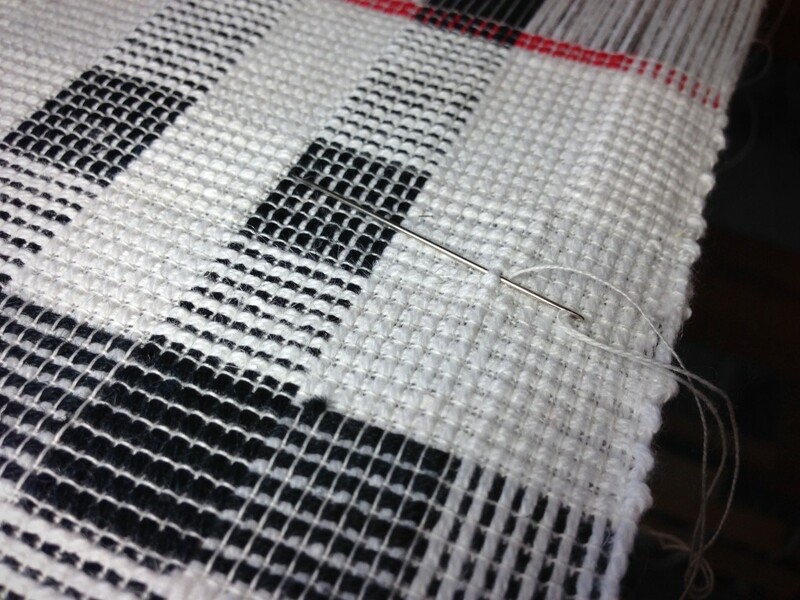 A replacement length of weft is needle-woven in. Series of errant floats are discovered after this fabric is removed from the loom. At 30 ends per inch, my eyes strain to see where to weave the needle. Needing more than the bright OttLite, I add magnification. Pairing the OttLite with the handheld lighted magnifier does the trick! 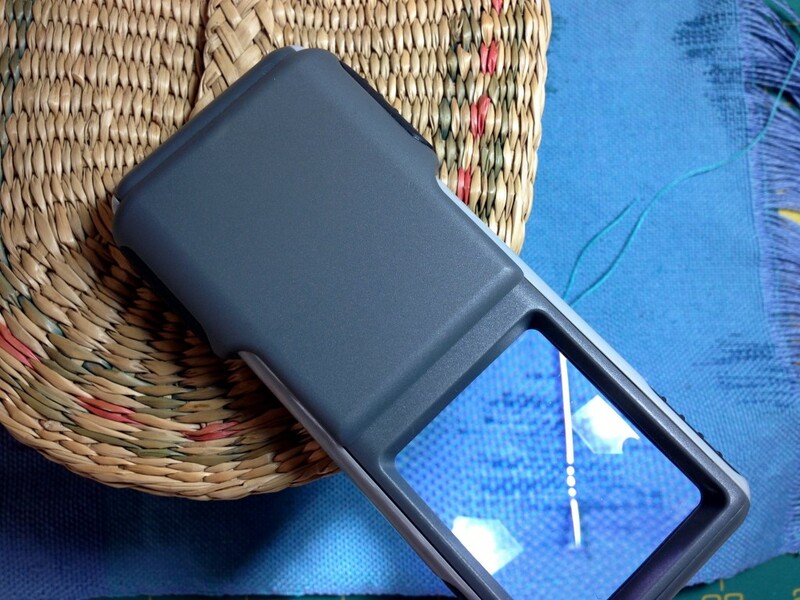 Lighted magnifier, reflecting the OttLite just overhead, balances perfectly on a small sewing basket. Now I can actually see the threads I am fixing. To further reduce eye strain, I am considering other lighting options. Have you had success with task lighting? I’d love to hear about it. Share your experience and recommendations in the comments. May you see what you need to see. 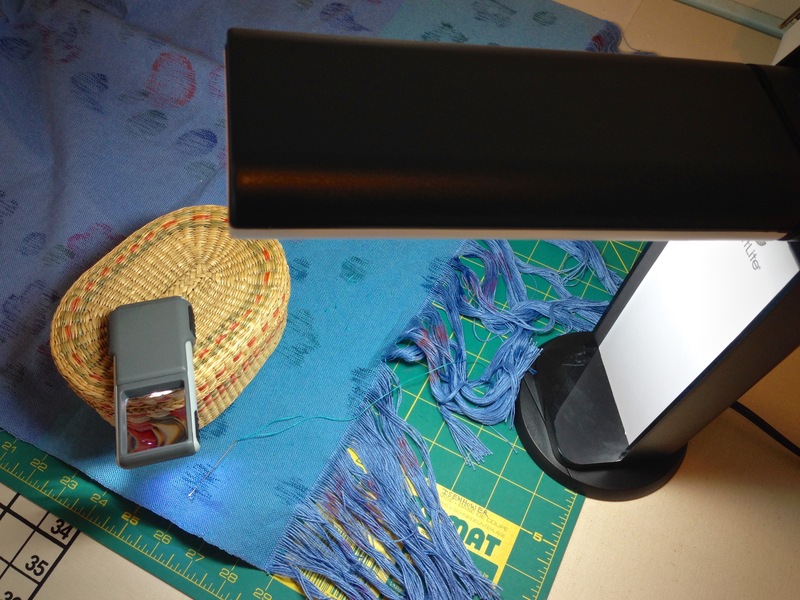 I use a wonderful ott type light that has a folding arm and big round magnifier glass in the center of the light. The light tube is in a circle and the magnifier is the size of a dessert plate. It almost resembles a dentist off light! Donna, that sounds perfect! I’m curious, is your light a floor lamp, table lamp, or clamp-on?